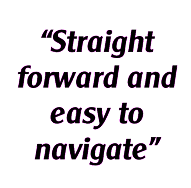 You may be completing Form E as a litigant-in-person, or filling it in for your solicitor to then finalise. The way in which you complete the Form E will depend on how computer-literate you are. If you can’t use a computer, then write on a blank one (download it here) neatly in black ink. If you are represented (have a solicitor) you won’t need to do any of the adding on the Form, or work out sub-totals and grand totals, as your solicitor will use a computer program that does the calculating for them. If you are unrepresented you will have to work through the addition - which is a bit of a pain, but needs doing carefully. If you are representing yourself and even vaguely computer literate!) 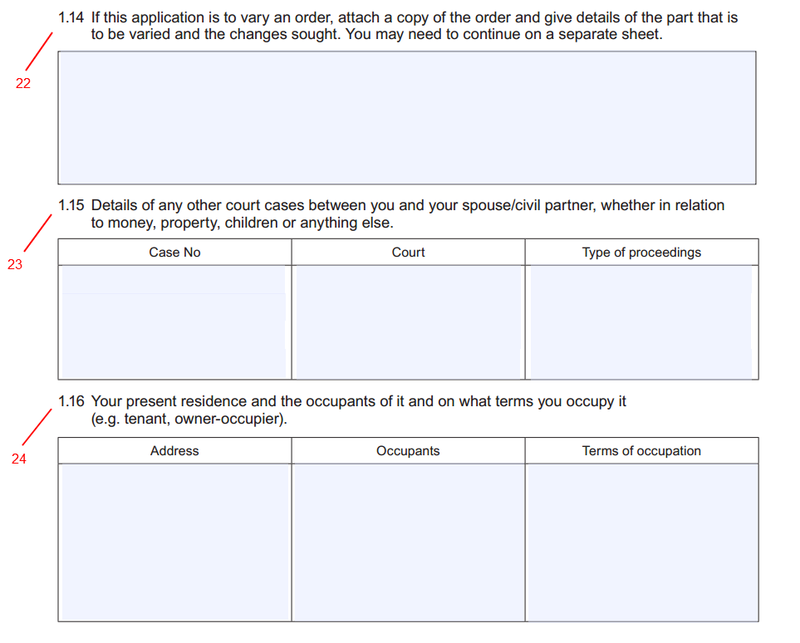 the easiest way to fill out Form E is to downloading the PDF version of Form E from the Court Service website here. Once you’ve downloaded and saved the file you’ll be able to save your changes (beware: you can’t save changes if you just fill it in on the Court Service website). 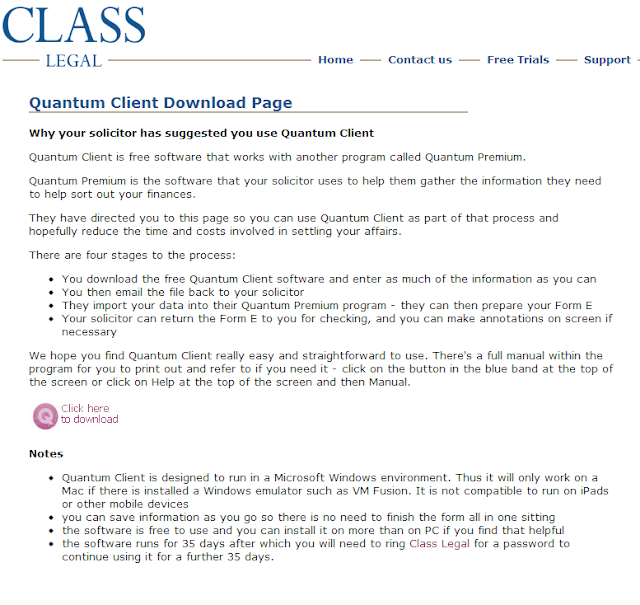 Note though that the boxes won’t expand – so if you’ve got more to fit in than the form allows you will either have to create additional sheets, or (if you have a solicitor) use Quantum Client as detailed below. 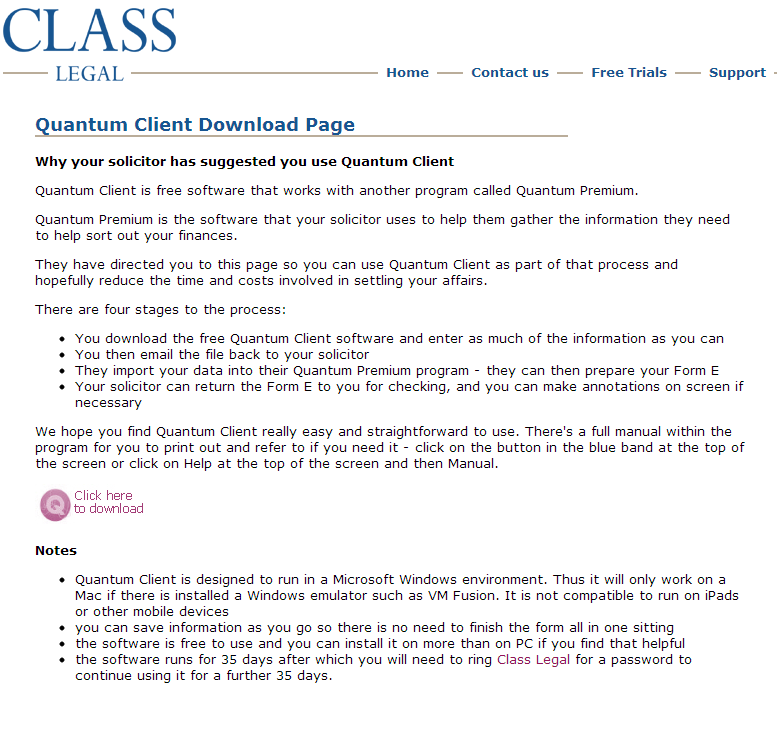 If you are represented, check with your solicitor how they prepare their Forms E. Quantum Client is an offshoot of the program, Quantum Premium, that most good solicitors use to complete Form E. It is produced by Class Publishing, who will let you use it free for 35 days, which should be long enough for you to produce your form. 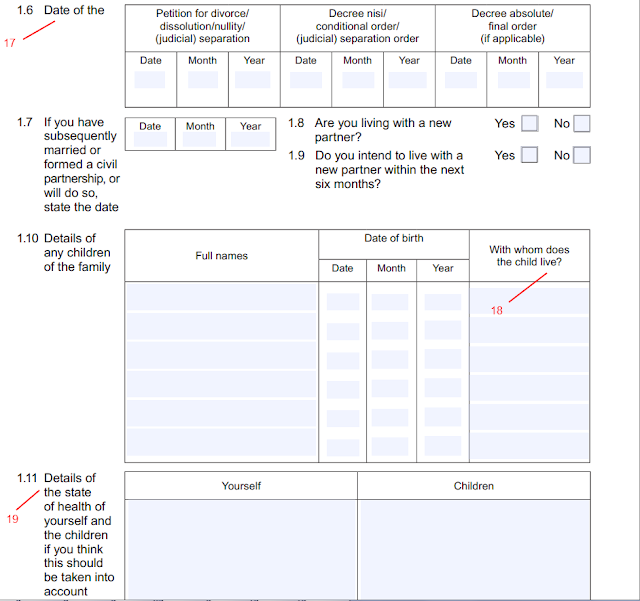 You can fill in your Form E, with help from the infinitely expandable boxes and the fact that the calculations are automatically handled, and then either print it off (note it will have the word 'Draft' on it) or email it to your solicitor. OK, now let’s move onto the detail of filling in Form E.
1. Name of the court where Form A was filed – e.g. Brighton County Court. 2. 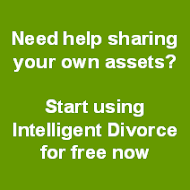 This case number is the same as the one for the divorce proceedings. You’ll have it on the forms you’ve been sent by the court. Insert that here. 3. The Applicant is the person who initiated the financial remedy application, i.e. sent in the Form A – this could be you or your ex-partner. Give the full name, including any middle names. 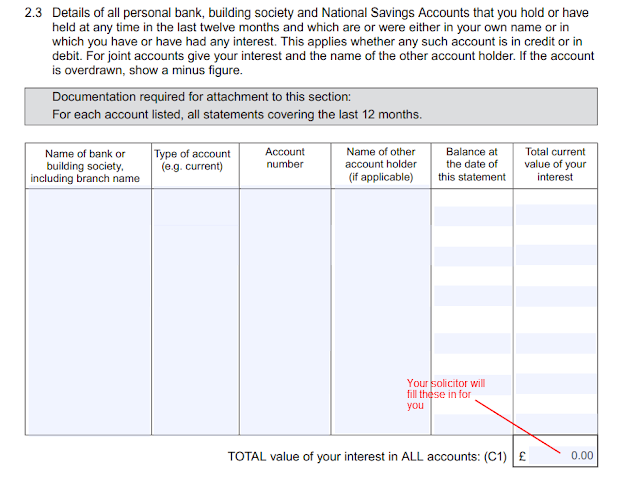 If you’re using Form E for voluntary disclosure (i.e. outside of the court process - see my post here) – write that in the court box and your names in any order in the two boxes below it. 5. Give your full name, including any middle names. 6. Tick whether you are the husband, wife or civil partner. 7. 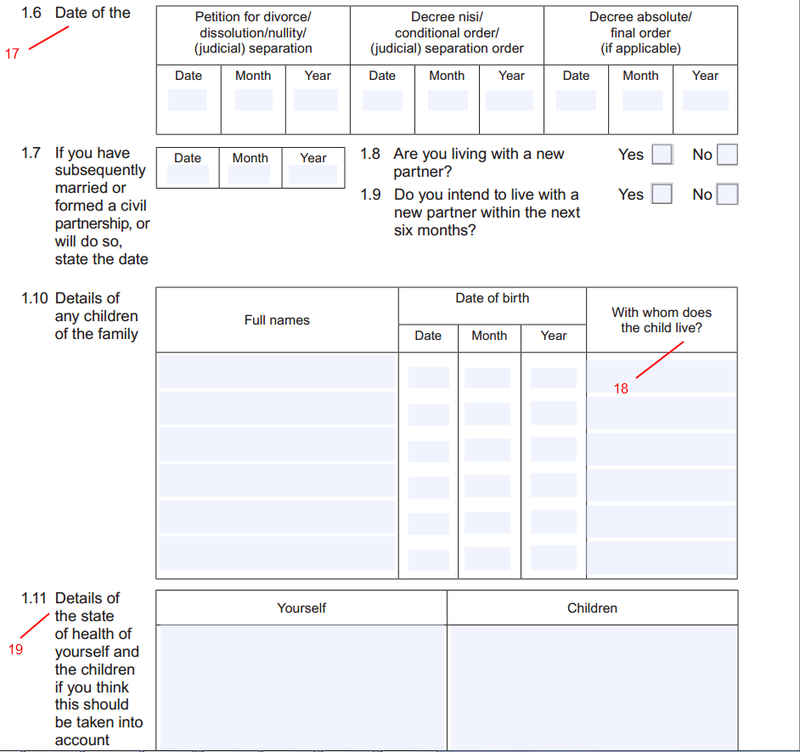 You need to give here the date you sign the form (which you do on the last page). I suggest leaving this blank for now, and coming back to it when you have finished the form. 8. Write the full name of the Applicant here (see above). 9. 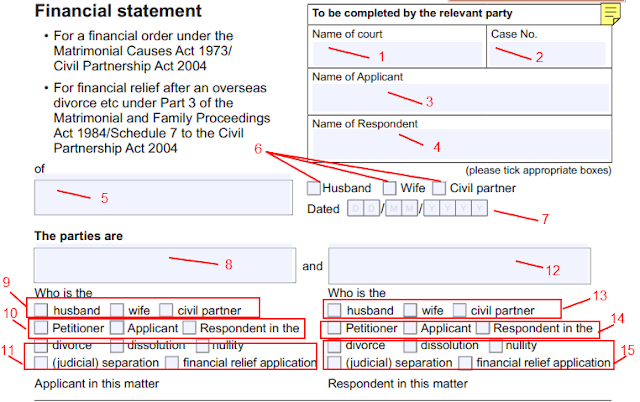 Tick whether the Applicant is the husband, wife or civil partner. The next two sets of tick boxes can be confusing – and are in fact badly worded. They relate to the divorce itself, as opposed to these financial proceedings. 10. Tick whether the person you’ve named in 8. is the Petitioner or Respondent in the divorce proceedings (you should know this – to remind you, the Petitioner is the one who started the divorce proceedings by filing the Divorce Petition at court). 11. Tick ‘divorce’ here (unless you are civil partners, in which case tick ‘dissolution’ or if you have applied for a judicial separation rather than a divorce). 12. Write the full name of the Respondent in the financial proceedings here (see above). It’s important to remember that this person may or may not be the Respondent in the divorce proceedings. 13. Tick whether the Respondent is the husband, wife or civil partner. 14. Tick whether the person you’ve named in 12. is the Petitioner or Respondent in the divorce proceedings. 15. Tick ‘divorce’ here (unless you are civil partners, in which case tick ‘dissolution’ or if you have applied for a judicial separation rather than a divorce). 16. 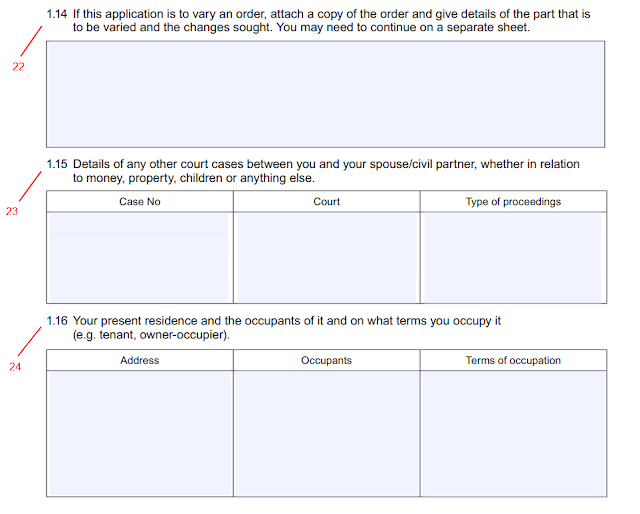 Leave this box blank (if you are represented by a solicitor they will be filling in the form for you! Most of these boxes are self-explanatory. 17. Only enter the dates for the documents that you have, and leave the others blank. 19. Only enter anything here if your health, or that of the children, has an impact on your ability to work full time. That is what this question is actually getting at. 20. You may not be certain about these future arrangements. Give your best guess, or say where you hope the children will go. 21. If the CSA have made a maintenance calculation, or there is a court order or agreement in place for child maintenance, enter details here. 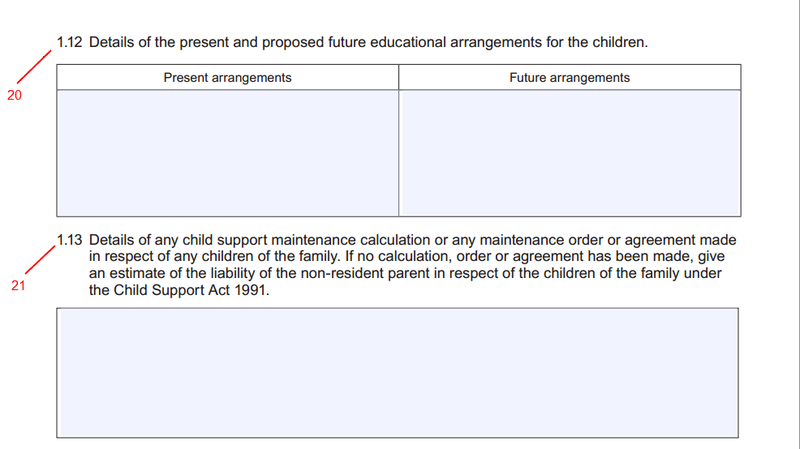 There is also a useful calculator here - which you should definitely use if there are children in the non-resident parent’s new family. 22. This should be self-explanatory: it applies mostly to variation of spousal maintenance claims. 23. You will know if there have been other proceedings. It does not include the divorce itself, so don’t enter that here. 24. Terms of occupation means ‘Tenant’, ‘Sole owner’, ‘Joint owner’ and so on. I hope this has helped you start your Form E. My next post will take you through the next sections, again step-by-step.